A pronounced trough is gradually weakening while moving from central towards the eastern Europe. At surface, a cold front is pushed across S Balkan peninsula. Another trough is approaching Iberia from the Atlantic while ridge builds in between across the Mediterranean. SLGT/MRGL risks have been issued for parts of NE Italy, Slovenia and NW Croatia with threat for isoalated marginal hail and heavy rainfall. A few 100 J/kg of MLCAPE builds up across the risk area within moderately strong wind shear. Conditions are supportive of organized storms and widespread graupel showers mainly in the afternoon hours. 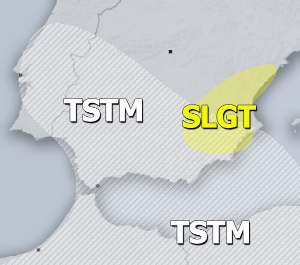 SLGT risk has been issued for parts of S Balkan peninsula including S Serbia, Albania, N Greece, Bulgaria and Macedonia where scattered organized severe storms with threat for large hail, severe winds and torrential rainfall are possible. With good instability available just ahead of the main cold front pushed through, coupled with strong shear and helicity, conditions are in place for alot of storm activity through the daytime hours. A MRGL risk has been issued for extreme NW Iberian peninsula with threat for heavy rainfall and strong to severe winds along the cold front crossing in the evening and nighttime hours. 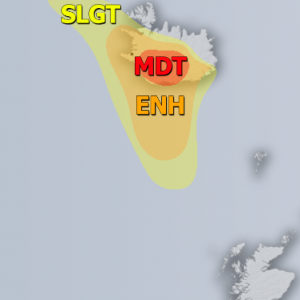 TSTM areas are placed where some isolated convective activity is expected, but should remain sub-severe.